Living in the new forest I am so lucky to be surrounded by so much wildlife. The new forest ponies are a great source of many painting, but also the donkey’s. At this time of year the donkey foals are appearing, and they are just so cute ( my pony paddy does not agree, feeling they are seiously weird with their big ears, his eyes pop out on storks, and he snorts loudly as he grows to what he believes is a big brave thoughbred- funny for a 25 year old boy) Here is my first donkey watercolour, it’s a pity the photo wasn’t better, as I could not get a better eye, but I am happy enough. Plan is to paint one of the cute babies next. 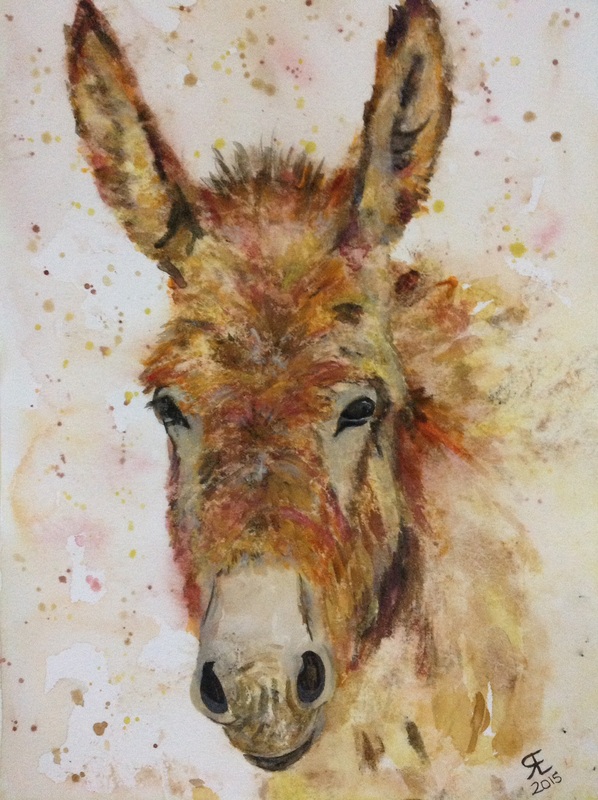 This entry was posted in art, donkey, new forest, watercolour and tagged art, donkey, new forest, painting, Painting, watercolour. Bookmark the permalink. Oh, grand! Very alive. The nose knows, it’s sort of smelling in action, I can feel it. Beautiful did you do this art work? Hi, thank you for your lovely comments, yes I did paint her, we have a small heard of donkeys on the forest that graze in the area I ride,( not mine, they are semi wild as are the ponies in the new forest, although I think the donkeys are pretty much handle able) they live out on the open forest during the summer months and get taken off the forest during the winter usually ( depends on the weather) lots of little ones are born right now, I hope to get a picture when I am off work next week, as plan to paint and ride during my time off. How much to paint my donkeys and horses? Gosh that is a very flattering comment, I think I have gone red! I am a hobby painter, and have only really sold a few paintings to family and close friends, when they have seen things on my wall and insisted I should sell to them, lol I could give it a go, I do love donkeys horses and hares, sometimes horses can be tricky, but hares and donkeys have lots of hair to hide behind, so can be vey forgiving.